: 1 GW nuclear, 4 acres, 24/7/365, reliable, sustainable with re-processing, possible future thorium. : 1 GW solar, 5,000 acres, 4/7/365, nothing at night. : 1 GW wind, 60,000 acres, 6/7/365, nothing when calm/stormy. : 1 GW coal, 15 acres, 0/7/365, reliable, sustainable but nothing with CCS mandated. : 1 GW gas, 2 acres, 24/7/365, reliable, sustainable with local/friendly shale. Russ Finley has a terrific article describing the “unsensational” version of the events around the failure of the the Daiichi Power Plants during the 2010 tsunami. For decades, anti-nuclear groups have played on people’s fears, conflating nuclear weapons with nuclear energy and exaggerating the radiation risks associated with it. If there were an airline equivalent of today’s anti-nuclear activists, the public might be told (for decades on end) that airline travel involves moving at 500 miles an hour, thirty thousand feet above the ground, in air that is so cold and rarefied you would suffocate and/or freeze within minutes without protection, in a (literally) paper-thin tube of pressurized aluminum, managed by a large for-profit corporation with razor thin profit margins. Oh, and they can be also used by terrorists as flying bombs. We would see footage of mangled bodies, corroded structure, and interviews of grieving loved ones. Come to think of it, that does sound scary. These hypothetical anti-airline activists might lobby politicians to foil attempts by airlines to properly deal with waste, forcing them to store it on site as much of the nuclear industry has to do with its waste. On the other side there would be engineers and scientists trying to use reason, statistics, and rational arguments to counter irrational fear. They would use numbers to prove that airline travel is the safest way to travel per unit length traveled …ah, we should all be glad there are not significant numbers of anti-airline activists. 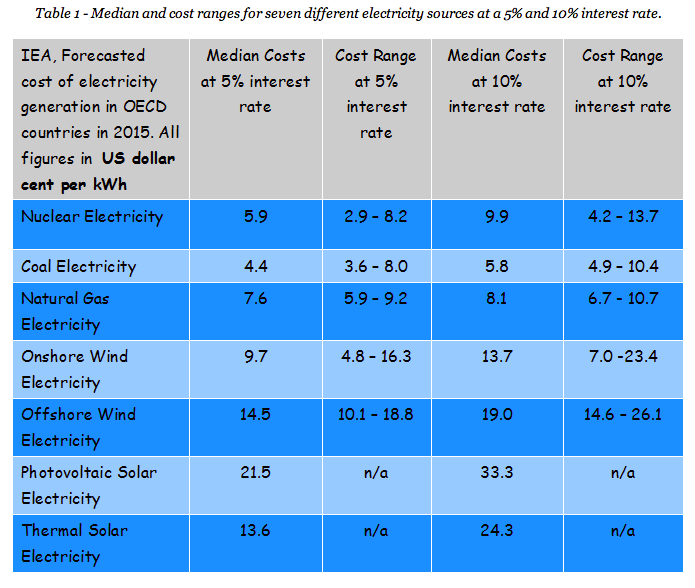 From Oil Drum “Renewable and fossil electricity generation costs compared”. “Is Nuclear Waste Really Waste”? Fascinating presentation by Kirk Sorensen, Chief Nuclear Technologist at Teldyne Brown Engineering and a PhD Student at University of Tennessee. This is a YouTube video of the presentation me made on 1 Nov 2010 at Google. Rupert Soames, CEO of Aggreko — a world leader in temporary energy supply — delivers some straight talk at the Scottish Parliament. Watch for the “I Feel Good” quote. Priceless.